We often talk about student-centered learning in our instruction, and we aim to design user-centered physical and virtual spaces. Which leads me to a key question: Is calling the reference service point a “reference desk” taking a user-centered approach? We have long been reminded that we should avoid using jargon when communicating with patrons, including on signage. I would argue that the term “reference” slips into jargon territory. But what other word or phrase best communicates what we offer? Reference work has changed over the years, and we’re now spending very little time on basic questions and more time on helping users grapple with big ideas and concepts related to finding, using, and creating information. However, some users may not know that we can help them navigate the more complex stuff. The term “reference” doesn’t seem to communicate it very well, either. There are examples of libraries that have tried new names for the reference desk, such as Research Desk or Ask Us Desk (both examples from libraries where I’ve worked). Other libraries have Information Desks, Help Desks, or make use of synonyms of those terms. In various case studies, librarians document a wide variety of names chosen when renaming reference service points, with an equally wide variety of reasons supporting those choices. While there doesn’t seem to be consensus on what to call a reference service point nowadays, these studies indicate that the term “reference” itself doesn’t resonate with users any longer. In 1999, Lisa Bartle suggested that an appropriate term to put on the sign is “help” because it most accurately encompasses what a patron is seeking. She notes, however, that there may be some reservations among librarians about working at a “help desk” (p. 399). More recently, Librarians at Regis University pondered if putting “help” on a sign would “convey a feeling of desperation”—which would not be encouraging-—or if, instead, it would communicate to users that “librarians are helpful and that they know they can get assistance by coming to the desk” (p. 391). In many cases, the hope is that the sign at the reference desk will work as a marketing tool. Perhaps by using a different word or phrase on signage, students might begin asking questions they didn’t know they could ask of a librarian before. Back in 2013, I conducted a field experiment as part of my master’s paper research where I relabeled the Reference Desk at the University of North Carolina-Chapel Hill’s Undergraduate Library as a Research Desk to see if the name change influenced the kinds of questions that patrons asked (spoiler alert: it didn’t). I suspect the reason that the signage alone didn’t seem to have an impact on the types of questions asked had something to do with other characteristics of that local context, such as the location of the desk in the building, reference services offered at other campus libraries, library culture, etc. Further research would have been needed to dig deeper and sort through these other factors, including surveying users to see what they thought. Users: Who is the primary user group you are hoping to target with the signage? As noted above, undergrads, grad students, and faculty will have different interpretations of terms and may hope to accomplish different things by engaging with a reference librarian. Does your campus library see a good number of members of the public or visitors coming through like mine does? If so, does this factor into the naming of the desk? Physical space: What is the set up? How visible is the desk? Is it a stand-alone service point, part of a unified desk, or is there no desk at all? Is the desk in a learning/info commons space or in a more “traditional” library setting, and does this have an effect on what the desk should be called? If your campus has other library locations, what terms are used at those libraries? Are you aiming for consistency across spaces? How do we weigh all these needs and considerations and arrive at a solution that is ideal? 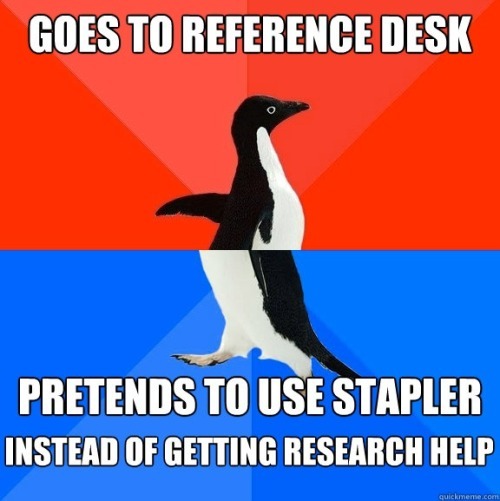 My inclination—based on personal experience, listening to my colleagues, and reading case studies—is that calling it a “reference desk” is not the most user-friendly option. So after reading up on best practices in user experience more broadly, an important step we can take is to engage our users to find out what works best in our library on our campus. Just as in other areas of our work, we need to continue to pay attention to how our users understand our services and resources and not rely on how we think users should understand the library. What we find may surprise us or challenge our assumptions. But (hopefully) we’ll end up with an option that works for our users. What does your library call this service point? Does it seem to have any impact—good or bad—on user behavior? *These may have been the top responses because those terms genuinely reflect what users thought would be the best terms or because both of those words appeared in the question. Author Bio: Melissa Harden is the First Year of Studies Librarian at the University of Notre Dame, where she works in Hesburgh Library (the building with the “Touchdown Jesus” mural). She is interested in researching ways to improve information literacy instruction for first-year students, including outside the library classroom. She received an MSLS from UNC-Chapel Hill in 2013 and a BS in Elementary Education from the University of Illinois at Urbana-Champaign in 2007. Before going to grad school, she taught fourth grade for four years in North Carolina. She has several hobbies, including baking, reading, and quoting movies.